Home schooling allows us to enjoy so many special experiences and meet a lot of fabulous people. About 15 years ago, I met Pam at a home school retreat in Alabama. 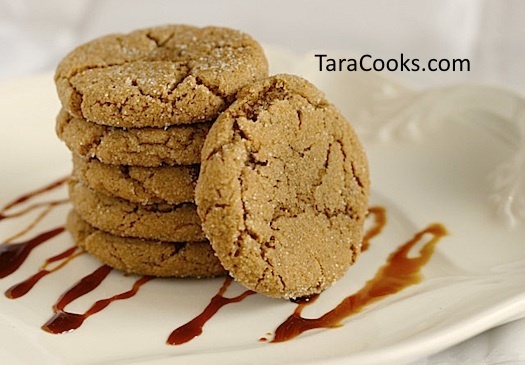 She shared her Soft Molasses Cookies with me way back then and later mailed me her recipe. Through the years we mailed each other Christmas cards and now we keep up with each other through Facebook. And I’ve made countless batches of these cookies. Pam, I don’t think I’ve ever told you how much my Granddaddy loved your Soft Molasses Cookies. Granddaddy has been gone a while now, but I found great joy in baking them for him each October for his birthday. So in honor of a dear friend Pam, and in honor of the sweetest Granddaddy that ever walked this earth, I give you the recipe for a special fall treat. My son would love these so much. These would be wonderful at Christmas time too! Great job with the picture Tara. Thanks Ladies. Yes these are perfect for Christmas too, and dipped in that caramel fondue. I probably have made these will all butter at some point in time. They may tend to spread out and be a little bit flatter. You could always bake a few to try then add a Tablespoon of flour if they are too thin for your preference. We added some chocolate chips – amazing combination. A bakery here in town does the same, wins awards every year. Tara, these sound fabulous. I haven’t had Molasses cookies in years. That’s about to change! Pinned. These are divine! I absolutely loved them. I drizzled melted bittersweet chocolate over half of the batch for a little extra variety, and it made them so pretty! Found these and just finished making them with my daughter. AMAZING! Thank you so much for the great cookie recipe! Can’t wait to try these! Sounds delicious. 😉 Thank you so much for sharing the recipe and the beautiful story. Can’t wait to try these! Sounds delicious. Thank you so much for sharing the recipe and the beautiful story.